Many of the questions you will have regarding game times and location are answered in the FAQ section (http://www.centennialyouthfootball.com/page/show/770289-frequently-asked-questions). You can also look at the website links per grade level to get an idea of what the game schedule and locations were last year. There is no guarantee it will be the same, but should give you an idea of what to expect. White helmet w/chin strap, Mouth guard, Shoulder pads, Black pants, Cup w/ supporter, Cleats, Practice jersey, Game socks - color TBD by Head Coach. Please make sure to properly fit the equipment prior to the first practice by following the guidelines listed in Player Safety and Health on the Parent Education section of our website, or by clicking on the below PDF for a quick overview. NEW: Dave's Sport Shop in Stillwater has assembled some great deals on football equipment specifically for CYFA players. Click the below file for more details. USED: make sure check out our CYFA Used Gear Exchange Page by CLICKING HERE. Coaches, Parents and Players should know that we follow the State High School League heat awareness policy. Please follow the above link for detailed information. As a busy parent, keeping your child healthy and safe is always a top priority. This site will help you recognize, respond to, and minimize the risk of concussion or other serious brain injury. The below instructions help set you up so your game and practice calendar stays current...options include Outlook, Apple, and Android. Add an Internet Calendar Subscription to Outlook 2007 or Newer. An Internet Calendar Subscription is a calendar that you download and view in Outlook. However, unlike a Calendar Snapshot, Internet Calendar Subscriptions are updated automatically. As game or practice information for your team changes, your subscribed calendar will reflect the updates. These calendars can be found on Web sites where people host calendars. On such a Web site, you can click a link to download and subscribe to the calendar, or someone can send you a link to the Internet Calendar Subscription in an e-mail message. This link is an Internet Web address that begins with webcal://, instead of http://, and ends with a file name that has the .ics file extension. Navigate to your Centennial team page. Copy and paste the webcal: address into Internet Explorer and press enter. (Figure 2 below.) You might be prompted to acknowledge that you are opening a hyperlink. You should click Yes only if you know and trust the validity of the linked calendar. To remove the Internet Calendar Subscription from the Navigation Pane, right-click the calendar name, and then click Delete calendar name. Internet Calendar Subscriptions can be added, changed, or removed from the Account Settings dialog box. On the Tools menu, click Account Settings, and then click the Internet Calendars tab. Add an Internet Calendar Subscription to iphone/ipad/ipod. An Internet Calendar Subscription is a calendar that you download and view in your iOS device. However, unlike a Calendar Snapshot, Internet Calendar Subscriptions are updated automatically. As game or practice information for your team changes, your subscribed calendar will reflect the updates. The iPhone, iPad, and iPod Touch support the ability to add and subscribe to remote calendars that will show up in the Calendar application alongside any other existing calendars you might already have (such as Google Calendar). On your iPhone, iPad, or iPod Touch, navigate to your Centennial team page, then click the iCal link on the bottom right of the team calendar (Figure 1). A page with a WebCal address will appear (Figure 2). Copy and paste the WebCal address into the Safari browser. Alternatively, you can go to the page on a normal web browser and you can send an email to yourself with the WebCal URL, then you can click on it from your iPhone/iPad/iPod email program. 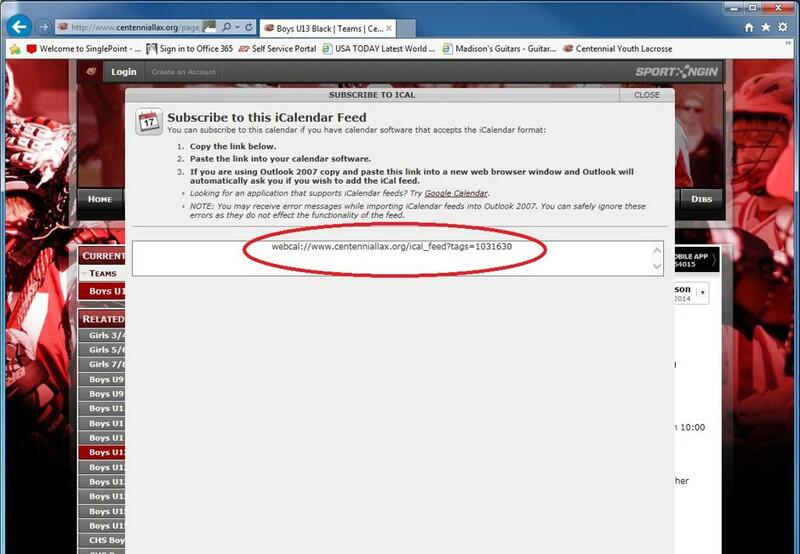 After clicking on the WebCal URL, you will be prompted to Subscribe to the calendar. Click Subscribe and follow further instructions on your screen to add your team calendar to your Calendar application (Figure 3). Note that it may take up to an hour or so for the events to show in the calendar (CYLA is providing the data immediately but it takes a while to sync onto the iPhone/iPad). Obtain the iCalendar URL for your team's schedule. You may wish to do this from your iPhone/iPad, or email this URL to an e-mail account on your iPhone/iPad. This will make it easier to follow the steps below. 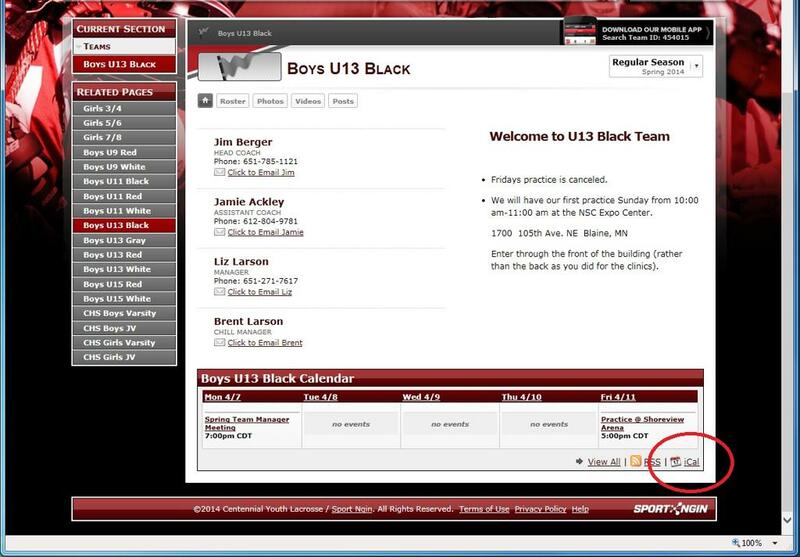 Enter a description for the calendar in the Description text box (for example, "Centennial U13 Black"). The description is optional -- by default it is the same as the iCalendar URL. The next time you go to your calendar, you should see your team's events from the calendar you added. If the events do not show up right away, try again in a few minutes (it may take time to download the events). Please note that events on subscribed calendars are not editable by the end user. Add an Internet Calendar Subscription to your Gmail Account on your Android Device. An Internet Calendar Subscription is a calendar that you download and view in your Android device. However, unlike a Calendar Snapshot, Internet Calendar Subscriptions are updated automatically. As game or practice information for your team changes, your subscribed calendar will reflect the updates. Google calendar supports the ability to add and subscribe to remote calendars that will show up in the Calendar application alongside any other existing calendars you might already have. On your device, navigate to your Centennial team page, then click the iCal link on the bottom right of the team calendar (Figure 1). A page with a WebCal address will appear (Figure 2). In the Calendar app, click the down-arrow next to Other calendars. Enter the WebCal address of the subscribed Calendar in iCalendar format, or if you have the iCalendar address of a calendar from a different application (for example, Apple's iCal), you can use this as well. Once you add the calendar, go to calendars, Menu. For Calendars to display, check CYLA. For Calendars to synch, check CYLA. Sometimes one or both may already be checked, but sometimes neither are checked.